DECEMBER 2013 CALENDAR IS HERE (link). Saturday, December 1st, 8th, 15th & 22nd, 6am-2pm – MARKET DAY at SAN ANTONIO GREEN MARKET in Santa Cruz (Trinidad). The market is located on Saddle Road, near Cutucupano Road in Upper Santa Cruz and will have fresh “produce (including unusual indigenous fruits, vegetables, herbs and seasonings), specialty foods and artisanal items.” San Antonio Green Market Website and Facebook Page. Saturday, December 15, 10am – FANATIC KITCHEN STUDIO DEMONSTRATION at SAN ANTONIO GREEN MARKET. FKS “chefs will demonstrate a special green (and red and yellow) salad, which you will be invited to sample! Come and share.” Free Admission. 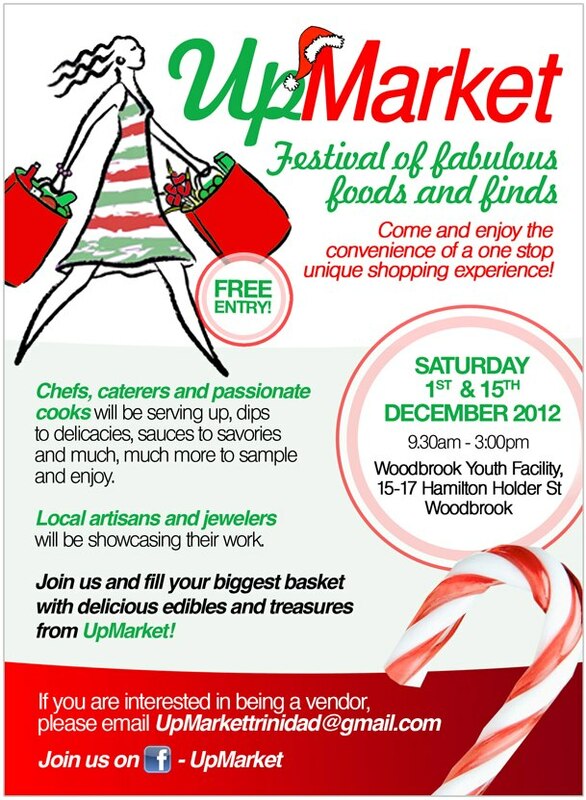 Saturday, December 15, 9:30am-3pm, UPMARKET at the Woodbrook Youth Facility (Woodbrook, Trinidad). Gourmet goodies, soaps, arts, crafts, jewelry, etc. at the monthly UpMarket in the West. (Additional parking at Jean Pierre Complex.) Free Admission. Sunday, December 16, PIG OUT at Barcode Sports Bar & Grill (Scarborough, Tobago). Bar Code’s annual PIG OUT is back so come enjoy pork done 15 ways for $150 per person. Live cooking can be viewed from 11am; Appleton Rum tasting at 2pm; Entertainment starts at 5pm; Food distribution from 6pm. Link to event on Facebook. Saturday, December 22, 9:30am-3pm, UPMARKET at the Woodbrook Youth Facility (Woodbrook, Trinidad). Last UpMarket (just addedd) before Christmas! Gourmet goodies, soaps, art, crafts, jewelry, etc. at the monthly UpMarket in the West. (Additional parking at Jean Pierre Complex.) Free Admission. Sunday, December 23, 10am-8pm, HOLIDAY SHOPPERS’ FAIR at Creative Arts Centre (Circular Road, San Fernando). This holiday market will feature gift ideas, jewelry, clothing and accessories, leather and wooden crafts, shoes and handbags, spa treatments, organic soaps, lots of local products, and of course food products from the D Soup Hut, House of Flava, Sugar & Spice & Everything Iced, and Fruit Edible Arrangements (Tastebud Tinglers). Link to flyer and Link to event on Facebook. FREE CLASSES – Ministry of Food Production (Agriculture Now) Farmers Training Centre’s December courses include Home Gardening; Seasoning Herbs Production; Winemaking; Pepper Sauce Making; Cocoa Production w/field trip, and more! Link to December class schedule, classes are offered in five venues — Centeno, Penal, Point Fortin, Rio Claro, and Princes Town. FREE! Friday (9am-5pm) & Saturday (9am-3pm), November 30th-December 1st, AMCO Christmas Warehouse Sale at AMCO Warehouse (Chaguanas, Trinidad). “Stock up on Christmas & New Year’s supplies at discounted prices: Vintage Wines, GREY GOOSE® Flavours, Tequila, Bacardi Flavoured Rum, and more.” Link to event on Facebook. Saturday, December 1, 9:30am-3pm, UPMARKET at the Woodbrook Youth Facility (Woodbrook, Trinidad). Gourmet goodies, soaps, crafts, jewelry, etc. at the monthly UpMarket in the West. (Additional parking at Jean Pierre Complex.) Free Admission. Sunday, December 2, 9am-5pm, THE ARTISAN’S CHRISTMAS MARKET at the Capital Plaza Hotel (Port of Spain, Trinidad). “Discover,sample and purchase handcrafted soaps, sauces, culinary delights, jewelry, clothing, bath and body products, gift baskets and much much more.” Food vendors include Rukshan Products (preservative-free pepper products; The Cake Lady; Aalon’s Delicacies (exotic dry breads: celery, tomato, pumpkin, carrot etc), cakes and cupcakes; Cuptails; and Perfect Peppers (homemade pepper products). Link to event flyer. Free Admission. Sunday, December 2, 12pm-7pm, GOURMET MARKET CHRISTMAS FIESTA at Preysal Community Center (Preysal, Couva, Trinidad). “Gourmet and a family themed fair with face painting and bouncy castle for the kids and grill/BBQ for lunch plus much more!” Link to event flyer. Free Admission. Sunday, December 2nd, 9am-3pm, CHEZ NOUS’ Christmas Showcase at The Verandah Restaurant (St. Clair, Trinidad). Gourmet foods and treats, art, clothing, accessories, candles, home decor, jewelry, body & bath products, etc. Link to Chez Nous Website; Chez Nous Facebook Page; Event flyer on Facebook. Free Admission. Saturday, December 8th, 9am-3pm, CHEZ NOUS’ Christmas Showcase at The Verandah Restaurant (St. Clair, Trinidad). Gourmet foods and treats, art, clothing, accessories, candles, home decor, jewelry, body & bath products, etc. Link to Chez Nous Website; Chez Nous Facebook Page; Event flyer on Facebook. Free Admission.